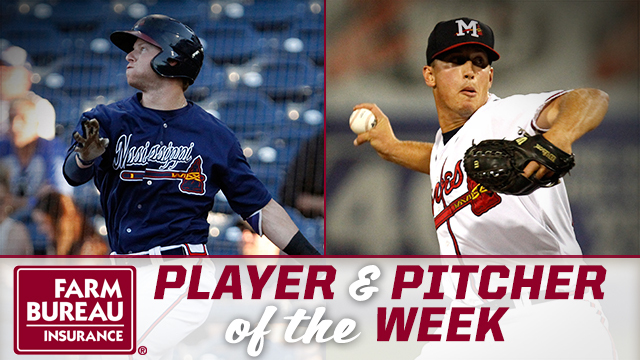 PEARL, MS -- Outfielder Dustin Peterson and RHP Lucas Sims have been named Mississippi Farm Bureau Player and Pitcher of the Week for the week ending Sunday, July 24. During the week, Peterson posted a .565 batting average and a .870 slugging percentage through six games. He had five doubles, a triple and nine RBI during the week, ranking the outfielder third-best in all of MiLB for the week. Currently, Peterson ranks eighth among Southern League leaders with a .296 average on the season. He's tied for first in games played (96) and leads the league in at-bats (379) and hits (112). Peterson sits second with 68 RBI, 29 doubles and 169 total bases. Peterson entered the 2016 season ranked by Baseball America as the Braves No. 22 prospect. The Arizona native was acquired by the Braves as part of a six-player deal with San Diego that sent Justin Upton to the Padres in December 2014. Sims, 21, received the same honor last week after going 1-1 with a 2.19 ERA in two starts. The right-hander made one start this past week, giving up no runs and picking up the win. Sims tossed 7.1 shutout innings against the Smokies Saturday night, walking four and striking out four. Sims started the season in Mississippi but went to Triple-A Gwinnett in late April before returning to Pearl in late June. In nine starts with the M-Braves, he's 2-3 with a 2.54 ERA. With the G-Braves, Sims was 2-6 with a 7.56 ERA in 11 games, 10 starts. Between both stops, he has recorded 119 strikeouts in 99.2 innings pitched, third-most in all of MiLB. A native of Lawrenceville, GA, Sims was selected by the Braves in the first round of the 2012 draft.